This cake looks like it was lifted straight from Willy Wonka’s factory, however it is incredibly easy to make. You don’t need to be an experienced baker, all you need is patience. If you’ve come across this because I’ve shared it before the Irish Constitutional Referendum tomorrow. Remember it’s the white page for the Marriage Referendum. I’ll be voting YES or TÁ by placing a nice clear “X” in the box – not a tick as this might not be counted. I’ve kept my mouth closed about the campaigning and posters for the most part (imagine that). I believe in equality for all families in all their wonderful shapes and sizes – ours doesn’t conform to the “norm” and certain posters have been quite insulting. I’ll be making my vote count tomorrow. I hope that you will choose to vote too. I baked the sponge on Tuesday and did the first layer of basic icing on the same day. Essentially it’s a victoria sponge recipe based on Delia’s classic, the key is how you colour and bake the mixture. To keep it simple I flavoured every single layer and the frosting vanilla. Trust me, if you’re under pressure for time you will need to keep it simple. If I had 4 sandwich tins I would have been able to bake it in half the time it took me. I didn’t, I had 2. However this means that it is easier to split and colour the mixture each time. It’s also easier to ensure you organise your colours because some lead onto another etc, etc. 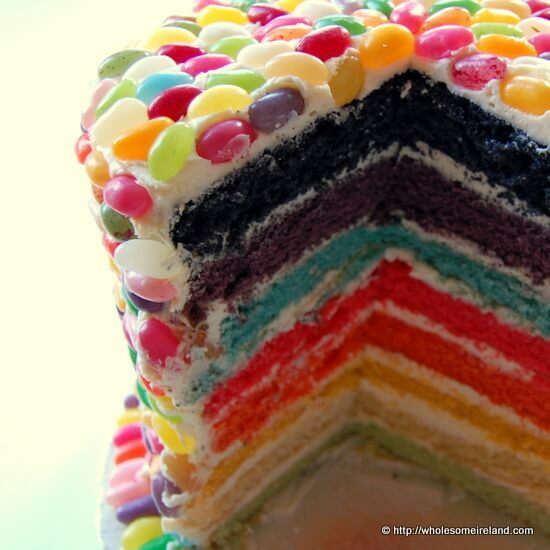 A classic rainbow cake would have 7 layers, this has 8. The reason being that every time I baked a batch of sponge, I baked 2. It would have been rude not to include the final layer. This is cake is loaded with sugar. It technically serves 20, however you could get more servings out of it because a slice of cake can be halved again. The ingredients cost me approximately €17 in total which means it works out at less than €1 per slice if you’re being generous. Because this cake is different to the norm, I’m going to write the recipe slightly differently so beware! You need to repeat the victoria sponge process 4 times in order to come up with 8 sponge cakes. Preheat your (fan) oven to 170 degrees celcius. Line the base of your sandwich tins with parchment paper and use the butter and flour to grease the sides, this is very important. Add 1 egg and beat until mixed. Add the second egg and beat until well mixed. If it begins to look curdled add a spoonful of flour. Pick up the baking parchment and pour the remaining flour into the mixing bowl. Beat until all the ingredients are well combined. Using the yellow food colouring add 1 teaspoon and stir until your batter turns yellow. Pour the yellow batter into the other sandwich tin. Wash and dry your bowl and make another batch of cake mixture. Note – you slightly need to overbake these sponges as you need them to hold better when you put them together. It’s easier as this way you don’t need cake dowels. Remove from the oven and leave to cool for 5 minutes in the tin before tipping upside down and removing the tins and then the baking parchment. Wash, dry, reline and regrease the tins. This time pour 2 teaspoons of red food colouring into all the batter. Remove half into 1 cake tin. Put a further 1 teaspoon of yellow food colouring into the second half of the batter (this gives you orange). This time pour 2 teaspoons of blue food colouring into the batter. Put a further 1 teaspoon of red food colouring into the batter (this gives you purple). This time pour 1 teaspoon each of yellow and blue food colouring into the batter (this gives you green). Pour a further 1 teaspoon of red food colouring on top. You should get a grey colour. If it is quite pale then add another teaspoon of each (red, blue and yellow) to get it darker. That’s it, your baking part is done. Give yourself a massive pat on the back. Keep your baked cake sections apart from one another by cutting squares of baking parchment and placing between each layer on a plate. Do this before they dry out. To decorate, finally! Please note this is a generous quantity. You may have some frosting left over but if you do pop it into a freezer bag and freeze for another day. Whisk the butter until light and fluffy. Add the icing sugar spoon by spoon on a low setting until it is completely mixed in. Use the milk to soften the mixture if it goes into a breadcrumb consistency. Use the spatula to spread a thin layer of buttercream frosting between each layer of cake. Once you have the layers in place then spread the buttercream around the side. 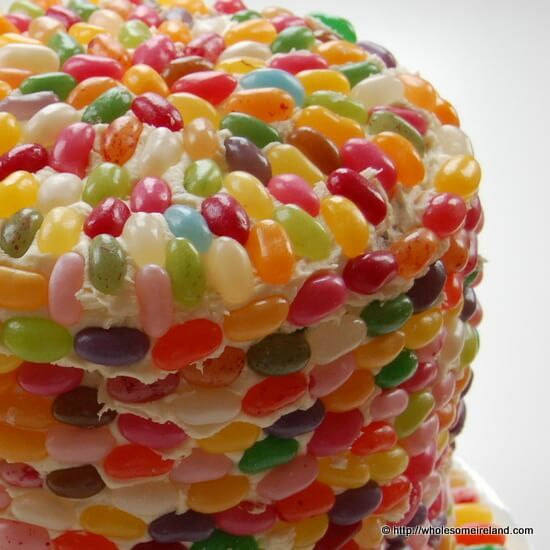 There’s no need for it to be neat as you’ll be hiding most lumps and bumps with the jellybeans. For the jellybeans I used 4 bags of Lidl own brand jellybeans. There are 13 flavours in this bag. If there were less I might have separated them and put them onto the cake in a pattern. Think of building a wall. Each line of jellybeans needs to be slightly offset from the next as this increases the structural integrity. 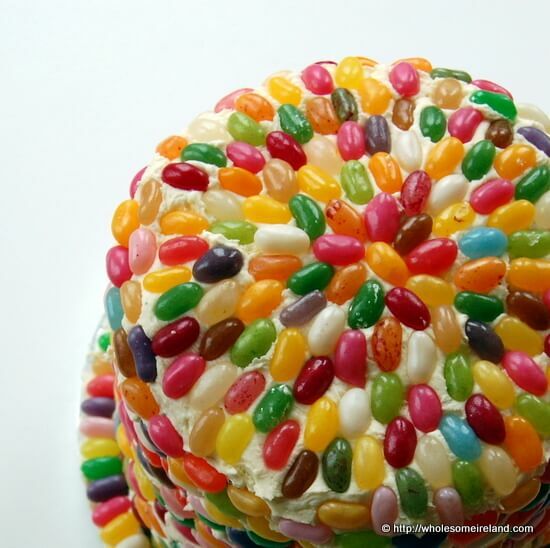 Smear some fresh buttercream onto the spot you’re going to stick the jellybeans before you put them on. That gives you some fresh “cement”. She has. We cut it open last night after singing Happy Birthday. She was over the moon with it before she cut it to see the surprise. A big hunk of the cake went to school today to share with her friends and show the Home Ec teacher. Her BFF’s (best friends forever) have requested it for their Birthdays next year. LOL! One word: WOW! That birthday cake is destined to be part of family legend now. Oh dear Peggy don’t be giving her any ideas! Oh dear not sure if their mums will be thanking you for that!! Looks amazing. I’m going to make a mini one with different shades of pink for my little ones birthday – great inspiration, thanks a million. Absolutely stunning outcome! A testament to all the hard work! Looks amazing & love the layers! Hi Caitriona,hoping to make this Thursday for my sons Christening on Saturday. I don’t have a cake box so I am just wondering can I just store it in the fridge uncovered? Thanks, hope it works for me! Hi Louise. Buttercream tends to go a bit shiny if left in the fridge uncovered. You could use cling film? RIght I’m making this for real in a couple of weeks (1st birthday). 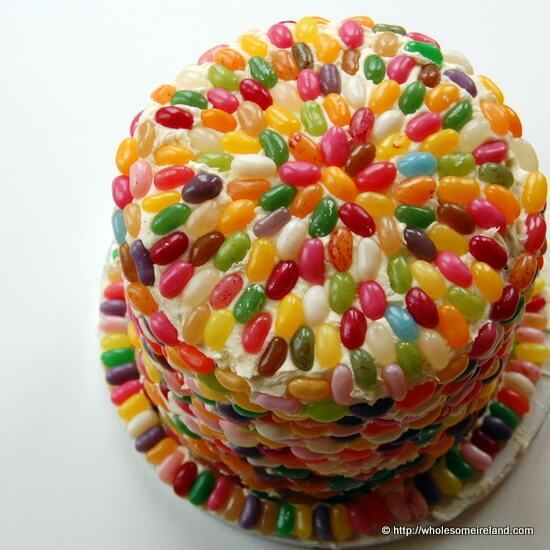 My current query is (oh there’ll be more) in order for it to balance, do you need to shave off the top of each of the cakes as in my experience they don’t come out of the tins flat, but raised in the middle? Because you’re not filling the tins well – they actually bake flat. You’re not going to fill them too high at all! I don’t shave the top off. Ask as many questions as you like. Top tip is to start baking now and freeze each layer, defrost the day before icing. It makes it far easier on you!